At Ringwood Dental we know how great it feels to be truly confident with your smile. And whether you’re looking to improve yours or simply in search of a routine check up, you can rest assured that you’re in safe hands with Ringwood Dental. With our talented dental team, state of the art clinics and individualised treatments you too will know how it feels to smile with confidence. A dental implant is a metal screw that is placed into the jaw bone. It acts as a root for a false tooth/teeth. As a finished result, the implant acts as a natural tooth would, neither the patient or anyone else should have any hint that an implant is there. All that is visible is the 'tooth'. You smile is precious and can be your biggest asset, so why not exploit it? Why not smile a brighter, whiter smile? Create an impression... Try our whitening systems. Dr Dhatt is one of the first dental practitioners to offer 6 month smiles in bournemouth. The six month smiles system utilises innovative clear brackets and tooth coloured wires to provide a common sense cosmetic adult orthodontic option for patients. 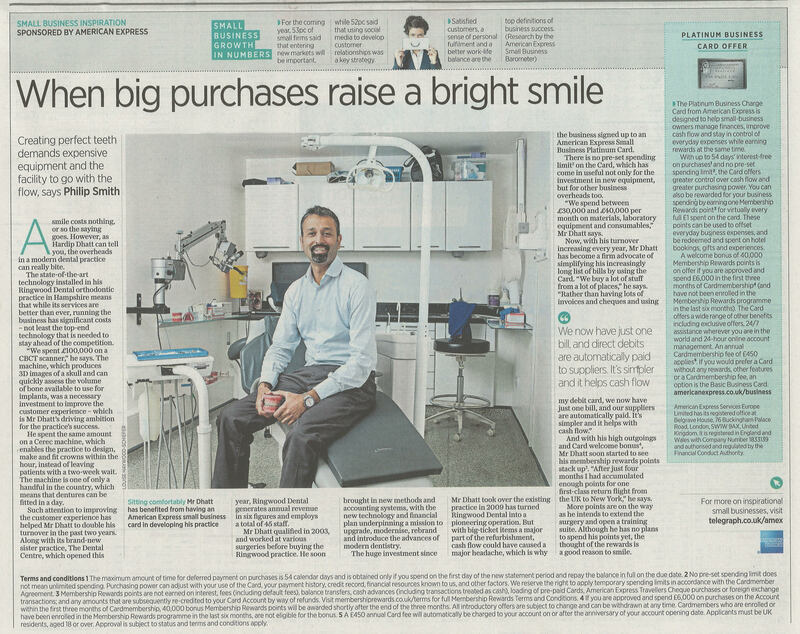 Dr. Hardip Dhatt interviewed in the Daily Telegraph. The dental practice is located between Southampton and Bournemouth, and serves the surrounding areas of Poole, Salisbury, Christchurch, Fordingbridge, Verwood, Lymington and Lyndhurt. I sometimes feel anxious at the thought of dental treatment. Our dentists at Ringwood believe in minimally invasive treatment and we carefully plan your care according to your individual needs. All treatment is carried out in our clinics that have been designed as calm, serene environments. And if you’re still a little worried, our experienced sedation dentistDr Sutcliffe is on hand. I’d like to spread the cost. Is this possible? We have a range of financial services to suit your needs, including monthly payment plans. See the Finance tab for more information. Of course – we reserve appointments for dental emergencies throughout the day. Just give us a call and we’ll do our very best to get you back on track.